The Spirax-Sarco 25P series pilot-operated reducing valve is widely used in steam systems. Accurate and stable pressure control can be realized irrespective of a change in upstream steam pressure or fluctuation of downstream load. The Spirax-Sarco 25P series pilot-operated reducing valve is unique in that one, or several, pilot valves can be installed or exchanged on the same valve. Besides being stable and reducing pressure, it can also control the temperature, the upstream pressure or the remote switch. Normal positions before start-up are with the main valve closed and the pilot valve held open by spring force or air pressure. Entering steam passes through the pilot valve into the main diaphragm chamber and also out through the control orifice. 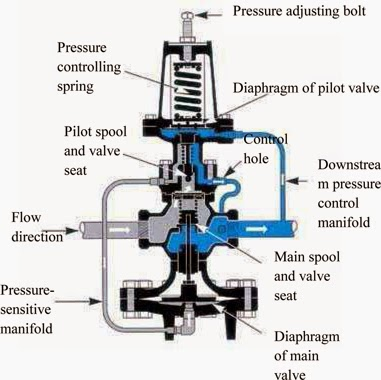 As flow through the pilot valve exceeds flow through the orifice, control pressure increases in the diaphragm chamber and opens the main valve. As steam flows through the main valve, the increase in downstream pressure feeds back through the pressure sensing line to the underside of the pressure diaphragm. When the force below that diaphragm balances the compression force of the spring above it, the pilot valve throttles. The control pressure maintained in the main diaphragm chamber positions the main valve to deliver just enough steam for the desired delivery pressure. Adjustment of the spring or air pressure above the pressure diaphragm changes the downstream pressure set point. When steam is no longer required, the sensing line pressure increases closing the pressure pilot and the control pressure bleeds back through the control orifice. This allows the main valve to hold the desired reduced pressure, and it may close tight for a dead-end shutoff.